This is going to take awhile, but boy, is it ever pretty! The knitted bind-off option for the hemlock ring involves a repeat that includes turning your work, and then knitting and purling into one stitch several times to create that lovely loop. 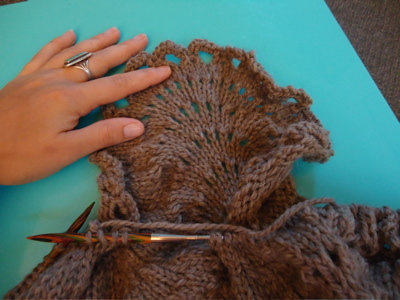 Then you turn back and bind off those stitches, and continue on to the next grouping. Slow, but worth it, I think. Also, last night we had a super easy, super delicious meal, completely inspired by this tomato tart over at inoakpark. I followed the recipe that K. links to, though I used slightly less butter in my crust, and didn’t need the additional tbsp of water. Also, I only slathered whole grain spicy mustard on half of the dough, as the boy is not a huge fan. 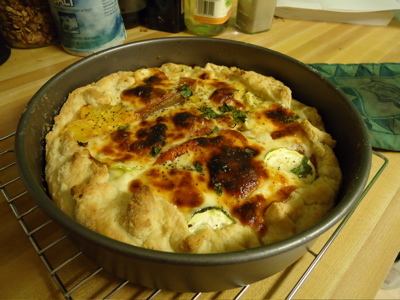 I used mozzarella instead of goat cheese, fresh flat-leaf parsley for the herbs, and tucked a few stray rounds of zucchini into the gaps left by my tomato slices. 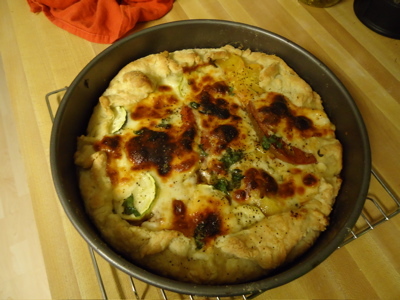 The dough took less than ten minutes to make, and requires no resting time. Thirty minutes after that, this deliciousness came out of the oven. I’m not ashamed to say we polished off the entire tart. I will be making this again. This entry was posted in kitchen, knitting and tagged baking, bind off, cascade ecowool, hemlock ring, in oak park, knitting, tomato tart by barefootrooster. Bookmark the permalink. The tart sounds (and looks) amazing! The bind-off is looking great. It is VERY labor intensive. I’m blocking this weekend, as I’m house-sitting for a friend who has way more space than I do for this kind of endeavor. Also, not liking mustard? Paul was the same way when we met, but now he enjoys it, especially good, grainy mustard. On a totally different note, my brother visited Cornell this weekend and told me: I quote “it’s pretty awesome there, but my GPA stinks”. Truth be told his GPA does not come close to stinking – but nevertheless I think he was enamored. Hope you have a great rest of your week. Have classes begun yet? The bind-off looks perfect, and I think you’ve just inspired tonight’s dinner! The bind off will be totally worth it! It looks good so far … almost as good as that tart. Yum! I’ve got to start cooking more. Feast for the eyes today!! Yum on both the bind off and the tart!! The tart looks great, I may try this tonight. looks like a great way to sneak more zuke’s in on the monkeys!